The security of a state is fundamental to its nature, and how it interacts on a domestic and global front. If security is threatened, for example, from colonialism, or a foreign policy affecting territorial sovereignty; or on a domestic level, civil unrest (racism or religious disputes), then the state will likely react. They will attempt to preserve their sovereignty, security, and for all intents and purposes, political perception in the international arena, in hopes to quell such disruptions, and in some instances, restore a balance of power. The domestic condition can be inextricably linked to the international circumstances of the time. The Gulf War in 1990 – 1991 arguably set a tone between Iraq and her allies, and western liberal democracies’ not only globally but domestically. The war resulted in thousands of innocent Iraqi civilian deaths. It also resulted in domestic upheaval, restructuring of government, and foreign troops remaining in the country, creating an animosity within the Muslim state. With the hand-over of sovereignty from the U.N. in 2004, uncertainty still lingered. American foreign policy stemming from the Bush administration that covered the sovereignty issues involving Pakistan, Afghanistan, and Iraq, are some of the many examples in the geo-political climate from 2001 until current, where the Western mentality of ‘us versus them’ is most apparent. It is with this consideration that I explore the notion of the West’s ‘innocence’ and ‘victimisation’ within the terrorist attack context. Has the West created this consequence as a result of its actions in the Middle East? Domestic manifestations of an ‘us versus them’ involving successful Muslim integration into Western and European-Western culture can also be attributed to the potential cause of increasing terrorist attacks predominantly aimed against the West. The “us and them” mentality where the West emphatically stipulate that our democracy, freedoms, liberty – our civilised nature – overshadows those of Islam can only create acrimony. Considering the West as an ‘innocent victim’ of these terrorist attacks is a contentious issue at best. Has the West created this consequence as a result of its actions in the Middle East? direct consequence, a war waged against Afghanistan, and surrounding nations in the region. 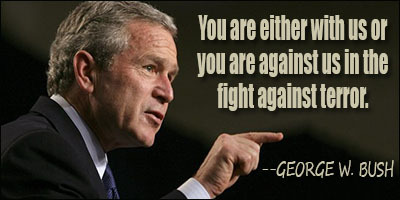 This consensus by the Bush administration to declare that “every nation, in every region, now has a decision to make. Either you are with us, or you are with the terrorists,” at the time, helped implement “an atmosphere of repression, fear and xenophobia,” that has since led to a domestic crisis when attempting to integrate Muslim communities into western society. As a result, containing terrorism becomes increasing difficult, as does maintaining the West’s ‘innocence’ for future attacks against them. The concept of terrorists in ‘our own back yard’ isn’t new. The September 11 attacks, 2001, witnessed two of the responsible terrorists, Zacarias Moussaoui and Richard Reid, enter the country on the Visa Waiver Program, as European travellers. The London and Madrid bombings were piloted by ‘home-grown’ terrorists. Radicals, though not linked directly to Al-Qaeda networks, or the like, are conducting acts of terror in their names, giving credence to the above integration concerns, which are isolating Muslims. On the opposite end of the scale you have the likes of Anders Behring Breivik in Norway, going on a rampage, killing over seventy people who displayed an open support of Muslim integration. His advocating of Muslim deportation from Europe, and the atrocities he committed in the name of this, were in themselves, a vivid account and demonstration of Islamophobia. Terrorist attacks have been ubiquitous since the beginning of the 21st century, but they aren’t a new occurrence solely isolated to post 9/11. There are contrary arguments laying blame for the terrorism that has swept through the twenty-first century with this consideration. As Reboul notes in her analysis of Western and Muslim interactions, the 9/11 attacks weren’t the first by Islamic terrorism. She presents an interesting insight that 9/11 was such a powerful act of terrorism only because it “showed that Islamic terrorism could strike at the heart of the most powerful (Western) state in the world.” She goes on to argue then, that the perpetrators may have acted irrationally, as she tries to make sense of it. But what if the current administration at the time also acted irrationally in response to the attacks? 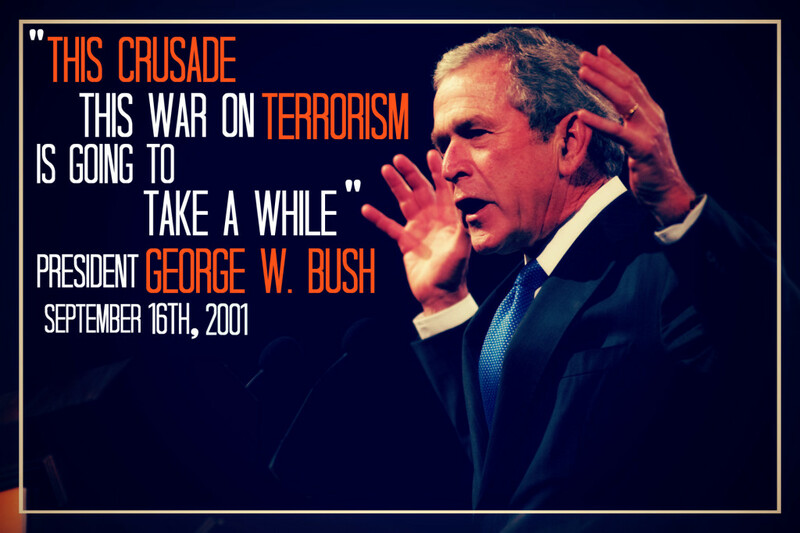 If this is so, then the logical deduction would be that George Bush’s implementation of foreign policy – his ‘war on terror’ – may have cost more than intended over due course, and continuing into present day. …that 9/11 was such a powerful act of terrorism only because it “showed that Islamic terrorism could strike at the heart of the most powerful (Western) state in the world. Time and again it is reiterated over several articles, and questioned in texts, the same thought presented in the Charlie Hebdo article: that the actions of the West intervening in disputes, so far as to engage in ‘war-making’ can be considered a direct cause to the terrorism now witnessed against liberal democratic states. In the eyes of the Middle East, could these causes be seen as a display of imperial rule by the United States? If so, does this propel terrorism further? Western/Western European states are now experiencing. Others may argue that the West is an innocent victim of the “barbarism;” but the West is all too quick in labelling terror within a religious context of Islam, portraying those who are truly innocent as monsters that must be suppressed in the name of freedom and democratic values. The media portrayal in the United States and Pakistan assists in this portrayal. A study that was conducted to evaluate how each ‘side’ projected information through the media in relation to the War on Terror, found that bias was more prevalent in the New York Times than Pakistan’s Dawn Editorial. The findings concluded a support for the hypothesis that the New York Times was “hesitant in opposing the Pentagon’s policy on War on Terror,” while the Dawn Editorials in Pakistan were more likely to criticise their own governments as well as support them, offering a more balanced view to their audience. Again small things like bias contribute to the growing dysfunction between sides. From the heavy handed approach of the Bush Administration – both Bush senior and junior, to the current passiveness of Obama failing to deliver on his initial promises to educate and bridge the gap between the Middle East and the West, the globalization of the world has no doubt assisted in the spread of terrorism through the internet. The seed was planted a long time ago, and has slowly grown over the course of history. The Gulf Wars, Afghanistan, Pakistan, Syria, and the ongoing Israel-Palestine dispute are only but a few of the questionable acts that the West have participated in, and in some cases, contentiously helped to create. Not only is the question of the West as an innocent victim of terrorism a controversial one, but one must now consider if some acts of terrorism are a response against West repression rather than merely an illogical attack by a group of independent psychopaths. Throughout this analysis I have attempted to address and highlight possible causes for the terrorist attacks against the West and if they are an innocent victim. The domestic front plays a vital role in foreign policy. How the foreign policy is presented and plays out largely sways the community within the state. Muslim communities struggling with integration may be more at risk to produce home-grown terrorists than those who aren’t. Hence, the Western world must accept some responsibility for this, on a domestic scale as well as global one. They are inextricably linked; one effects the other with every decision made and every speech given. With the West placing their ideals above those who differ on religious and ethnic ground, and accepting “collateral damage” as a matter of due course, they must expect future consequences under the guise of terrorism. It’s in our inherent nature – our humanity – to seek out “political change” until that change is for the better. Not only is the question of the West as an innocent victim of terrorism a controversial one, but one must now consider if some acts of terrorism are a response against West repression rather than merely an illogical attack by a group of independent psychopaths. Lederer, M, Edith. ‘New U.N. Resolution Gives Iraq Sovereignty’, AP Online, 22 May, 2004. Cox, Patrick. ‘Can the Western powers be successful in the ‘war against international Islamist terrorism’?’ Conference Papers — Northeastern Political Science Association. 2009, p1., Database: Political Science Complete. Kegley, W, Charles, Jr. (11th eds.). ‘Foreign Policy Decision Making,’ World Politics: Trend and Transformation, Thomson Wadsworth, 2007, p55-91. Gerges, A, Fawaz. ‘The Obama approach to the Middle East: the end of America’s moment?,’ International Affairs, Blackwell Publishing Ltd, 2013, p299-323. Ozturk, ‘The War on Terror, or the War on Civil Liberties,’ p. 106. Ozturk, ‘The War on Terror, or the War on Civil Liberties,’ p. 107. Toronto Star (Canada), Akbar, Javed. ‘Why the West has lost goodwill of Muslims’, 29 July 2005. Archick, Kristin, Belkin, Paul, Blanchard, M, Christopher, Ek, Carl, and Mix, E, Derek. ‘Muslims in Europe: Promoting Integration and Countering Extremism,’ Current Politics and Economics of Europe. 2011, Vol. 22, Number 4, p563-572. Archick, Kristin, et. al. ‘Muslims in Europe: Promoting Integration and Countering Extremism,’ p566. Archick, Kristin, et. al. ‘Muslims in Europe: Promoting Integration and Countering Extremism,’ p564. ‘After Charlie Hebdo’ The Nation. 2/2/2015, Vol. 300 Issue 5, p3-4. 2p. The Nation, After Charlie Hebdo, p. 1. Tamim, Ansary. ‘A letter from an Afghan-American,’ Humanist. 2001, Vol. 6, Issue 6, p4-5. Gerges, A, Fawaz. ‘The Obama approach to the Middle East: the end of America’s moment?,’ p300.